My immediate reaction while watching “Youth” and when the end credits came on was that this was a load of ‘artistic’ garbage but I thought a stronger word! There is so much excess in this film ranging from annoying music tracks, songs that don’t make sense, fantasy images supposedly being taken for real, people that are in another movie just as scenes are thrown in to show the director’s, and film editor’s, expertise but not necessarily for a movie called “Youth”. Performances by Michael Caine, Harvey Keitel, Paul Dano and Rachel Weisz are defeated by the script and what they have to say. Younger actors, except for Weisz, are secondary to the plot and are arranged in so many trick shots, as many of the extras are, that the camera, not the actors or screenplay, are the major attraction. Jane Fonda, grotesquely made up, plays a veteran actress who shows that she will do almost anything in a film even if it means being foul mouthed. Old people are treated like robots and/or sheep with all treated alike and not able to think for themselves. It all takes place in a spa where people are continuously given massages or spread out in pools or steam rooms. The positive aspects of the movie, where the spa is located, are beautiful scenes of the Swiss alps.. Both Caine and Fonda are being mentioned for possible Oscar nominations for Best Actor and Best Supporting actress for her few moments on screen. I am big fans of both but I don’t see that happening for either unless watching him conduct a herd of cows which has no humor or seemingly any purpose as we already know he is a conductor/composer of some fame. 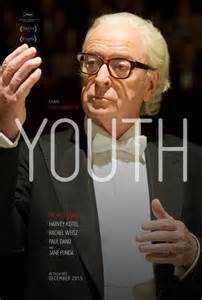 “Youth” is for someone who believes that a man can levitate, which happens, and may be what the movie is about.